Famine forces Israelites to migrate to Egypt. c.13th century Exodus from Egypt: Moses leads Israelites from Egypt, followed by 40 years of wandering in the desert. Torah, including the Ten Commandments, received at Mount Sinai. c.1020 Jewish monarchy established; Saul, first king. c.1000 Jerusalem made capital of David's kingdom. c.960 First Temple, the national and spiritual center of the Jewish people, built in Jerusalem by King Solomon. 722-720 Israel crushed by Assyrians; 10 tribes exiled (Ten Lost Tribes). Judah conquered by Babylonia; Jerusalem and First Temple destroyed; most Jews exiled. 538-515 Many Jews return from Babylonia; Temple rebuilt. 332 Land conquered by Alexander the Great; Hellenistic rule. 142-129 Jewish autonomy under Hasmoneans. 129-63 Jewish independence under Hasmonean monarchy. 63 Jerusalem captured by Roman general, Pompey. 70 Destruction of Jerusalem and Second Temple. 73 Last stand of Jews at Masada. 132-135 Bar Kokhba uprising against Rome. c. 210 Codification of Jewish oral law (Mishna) completed. c. 390 Commentary on the Mishna (Jerusalem Talmud) completed. 691 On site of First and Second Temples in Jerusalem, Dome of the Rock built by Caliph Abd el-Malik. 1564 Code of Jewish law (Shulhan Arukh) published. 1860 First neighborhood built outside walls of Jerusalem's Old City. 1882-1903 First Aliya (large-scale immigration), mainly from Russia. 1904-14 Second Aliya, mainly from Russia and Poland. 1909 First kibbutz, Degania, and first modern all-Jewish city, Tel Aviv, founded. 1917 400 years of Ottoman rule ended by British conquest; British Foreign Minister Balfour pledges support for establishment of a "Jewish national home in Palestine"
1920 Histadrut (General Federation of Labor) and Haganah (Jewish defense organization) founded. Vaad Leumi (National Council) set up by Jewish community (Yishuv) to conduct its affairs. 1921 First moshav (cooperative village), Nahalal, founded. 1922 Britain granted Mandate for Palestine (Land of Israel) by League of Nations; Transjordan set up on three-fourths of the area, leaving one fourth for the Jewish national home. 1924-32 Fourth Aliya, mainly from Poland. 1925 Hebrew University of Jerusalem opened on Mount Scopus. 1929 Hebron Jews massacred by Arab terrorists. 1931 Etzel, Jewish underground organization, founded. 1933-39 Fifth Aliya, mainly from Germany. 1936-39 Anti-Jewish riots instigated by Arab terrorists. 1939 Jewish immigration severely limited by British White Paper. 1939-45 World War II; Holocaust in Europe. 1941 Lehi underground movement formed; Palmach, strike force of Haganah, set up. 1944 Jewish Brigade formed as part of British forces. 1947 UN proposes the establishment of Arab and Jewish statesin the Land. Israel invaded by five Arab states (15 May). Israel Defense Forces (IDF) established. 1962 Adolf Eichmann tried and executed in Israel for his part in the Holocaust. 1975 Israel becomes an associate member of the European Common Market. 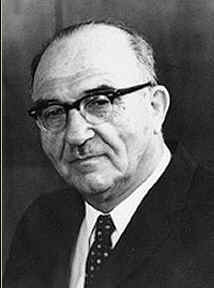 1977 Likud forms government after Knesset elections, end of 30 years of Labor rule. 1978 Camp David Accords include framework for comprehensive peace in the Middle East and proposal for Palestinian self-government. 1981 Israel Air Force destroys Iraqi nuclear reactor just before it is to become operative. 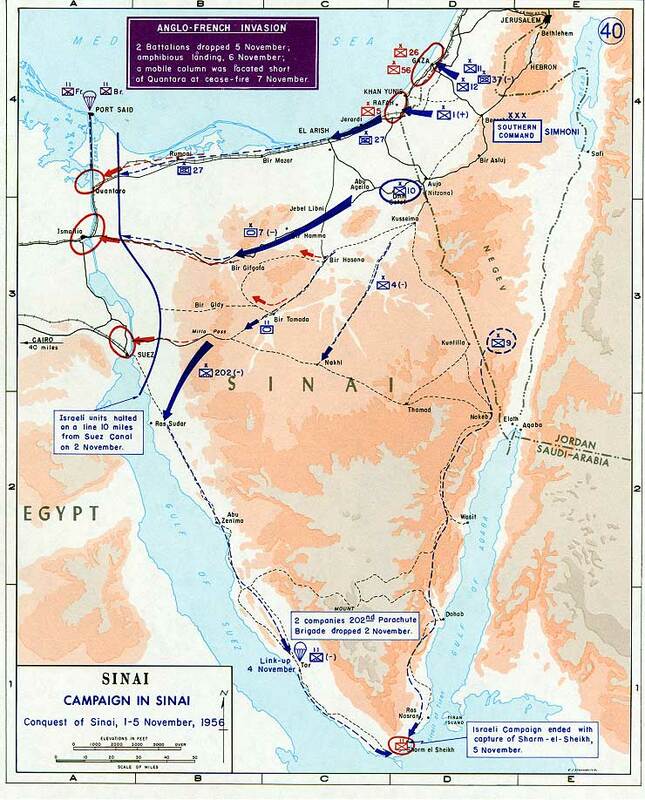 1982 Israel's three-stage withdrawal from Sinai Peninsula completed. Operation Peace for Galilee removes Palestine Liberation Organization (PLO) terrorists from Lebanon. 1984 National unity government (Likud and Labor) formed after elections. 1985 Free Trade Agreement signed with United States. 1987 Widespread violence (Intifada) starts in Israeli-administered areas. 1988 Likud government wins elections. 1991 Israel attacked by Iraqi Scud missiles during Gulf war. Middle East peace conference convened in Madrid; Operation Solomon, airlift of Jews from Ethiopia. 1992 Diplomatic relations established with China and India. 1993 Declaration of Principleson Interim Self-Government Arrangements for the Palestinians signed by Israel and PLO, as representative of the Palestinian people (Oslo Accords). Implementation of Palestinian self-government inGaza Strip and Jericho area. Full diplomatic relations with the Holy See. Morocco and Tunisia interest offices set up. Israel-Jordan Peace Treaty signed. Rabin, Peres, Arafat awarded Nobel Peace Prize. 1995 Broadened Palestinian self-government implemented in West Bank and Gaza Strip; Palestinian Council elected. Prime Minister Rabin assassinated at peace rally. Shimon Peres becomes prime minister. Israel celebrates its 50th anniversary. Israel and the PLO sign the Wye River Memorandum to facilitate implementation of the Interim Agreement. 1999 Ehud Barak (left-wing One Israel party) elected prime minister; forms coalition government. Israel and the PLO sign the Sharm-el-Sheikh Memorandum. 2000 Visit of Pope Paul II. Israel withdraws from the Security Zone in southern Lebanon. Israel admitted to UN Western European and Others Group. Renewed violence (Second Intifada). Prime Minister Barak resigns. 2001 Ariel Sharon (Likud) elected Prime Minister; forms broad-based unity government. The Sharm-el-Sheikh Fact-Finding Committee report (Mitchell Report) issued. Palestinian-Israeli Security Implementation Work Plan (Tenet ceasefire plan) proposed. Rechavam Ze'evy, Minister of Tourism, assassinated by Palestinian terrorists. Israel launches Operation Defensive Shield in response to massive Palestinian terrorist attacks. Israel begins building the anti-terrorist fence to stop West Bank terrorists from killing Israeli citizens. Prime Minister Sharon disperses the Knesset, calling for new elections to be held on 28 January 2003. Right-of-center coalition government formed by Prime Minister Ariel Sharon. Israel accepts the Roadmap. Israel carries out the Disengagement Plan, ending Israel's presence in the Gaza Strip. After Prime Minister Sharon suffers a stroke, Ehud Olmert becomes acting prime minister. Following elections on 28 March, Prime Minister Ehud Olmert forms new government led by the Kadima Party. Israel carried out military operations against Palestinian terrorists in Gaza after kidnapping of Israeli soldier. The Second War in Lebanon, during which Israel carried out military operations against Hizbullah terrorism from southern Lebanon, following missile attacks and kidnapping of two Israeli soldiers. Shimon Peres elected President by the Knesset. Israel declares Gaza "hostile territory" following Hamas violent takeover of Gaza Strip. Israel celebrates its 60th anniversary. Israel launches its Gaza Operation (Operation Cast Lead) in response to the barrage of over 10,000 rockets and mortars fired from the Gaza Strip. Benjamin Netanyahu is elected Prime Minister in national elections held in February 2009, and forms a broad-based coalition government The city of Tel Aviv celebrates its 100th anniversary. Israel joins the Organization for Economic Co-operation and Development (OECD). Following World War II, the British withdrew from their mandate of Palestine. On 29 November 1947 the United Nations Partition Plan for Palestine or United Nations General Assembly Resolution 181, a plan to resolve the Arab-Israeli conflict in the British Mandate of Palestine, was approved by the United Nations General Assembly, at the UN World Headquarters in New York. The UN partitioned the area into Arab and Jewish states, an arrangement rejected by the Arabs. Subsequently, the Israelis defeated the Arabs in a series of wars without ending the deep tensions between the two sides. 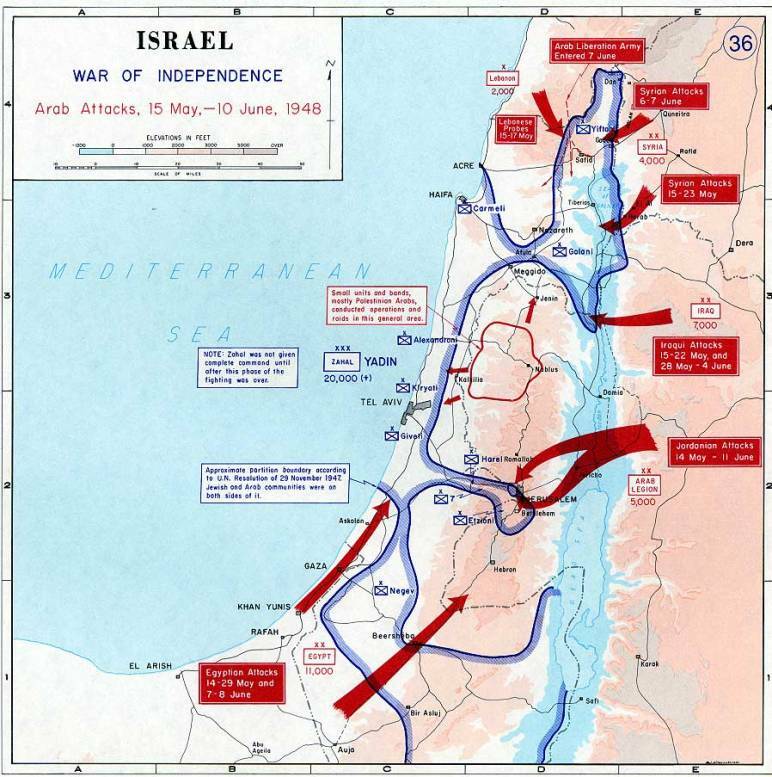 1948 War of Independence-The 1948 Arab-Israeli War, referred to as the "War of Independence or as the "War of Liberation by Israelis, is the first in a series of armed conflicts fought between Israel and its Arab neighbors in the ongoing Arab-Israeli conflict. After the United Nations proposed to partition the territory of the British Mandate of Palestine into two states, Jewish and Arab, the Arabs refused to accept it and the armies of Egypt, Syria, Transjordan, Lebanon and Iraq, supported by others, attacked the newly established State of Israel which they refused to recognize. As a result, the region was divided between Israel, Egypt and Transjordan. 1956 Sinai War-The Suez Crisis was a war fought on Egyptian territory in 1956. The conflict pitted Egypt against Israel, the United Kingdom and the Fourth French Republic.Eventually, pressure from the United States forced Britain, France, and Israel to withdraw. 1967 Six Day War-The Six-Day War was fought between Israel and the Arab states of Egypt, Jordan, Iraq, and Syria. When Egypt expelled the United Nations Emergency Force from the Sinai Peninsula, increased its military activity near the border, and blockaded the Straits of Tiran to Israeli ships, Israel launched a pre-emptive attack on Egypt's air force fearing an imminent attack by Egypt. Jordan in turn attacked the Israeli cities of Jerusalem and Netanya. At the war's end, Israel had gained control of the Gaza Strip, the Sinai Peninsula, the West Bank, and the Golan Heights. 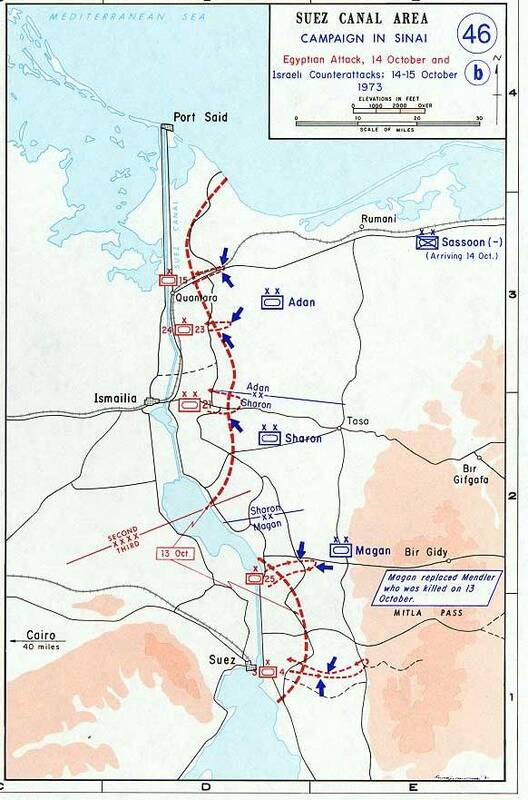 1973 Yom Kippur War-The Yom Kippur War was fought from October 6 to October 26, 1973, between Israel and a coalition of Arab nations led by Egypt and Syria. 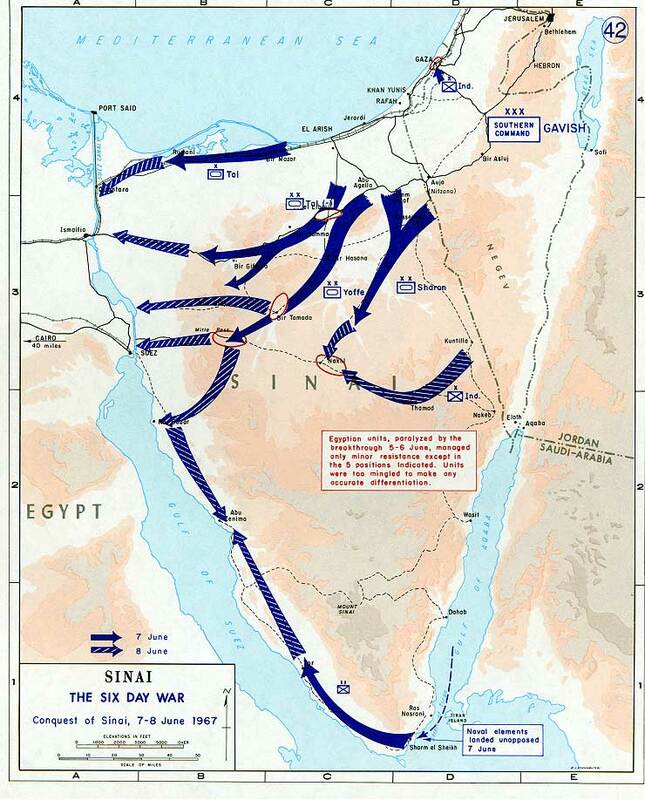 The war began on the Jewish holiday of Yom Kippur with a surprise joint attack by Egypt and Syria crossing the cease-fire lines in the Sinai and Golan Heights, respectively, which had been captured by Israel in 1967 during the Six-Day War.The Egyptians and Syrians advanced during the first 24–48 hours, after which momentum began to swing in Israel's favor. By the second week of the war, the Syrians had been pushed entirely out of the Golan Heights. 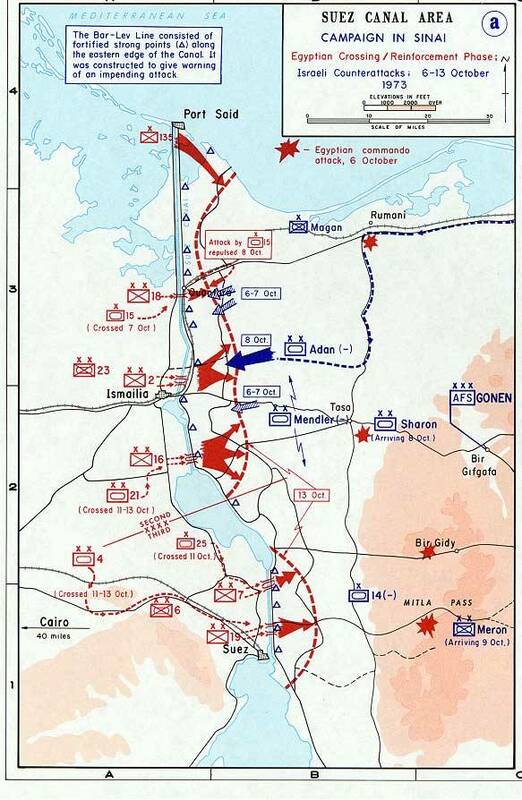 In the Sinai to the south, the Israelis had struck at the "seam" between two invading Egyptian armies, crossed the Suez Canal (where the old ceasefire line had been), and cut off an entire Egyptian army just as a United Nations cease-fire came into effect. On 25 April 1982, Israel withdrew from the Sinai pursuant to the 1979 Israel-Egypt Peace Treaty. Israel and Palestinian officials signed on 13 September 1993 a Declaration of Principles (also known as the "Oslo Accords") guiding an interim period of Palestinian self-rule. Outstanding territorial and other disputes with Jordan were resolved in the 26 October 1994 Israel-Jordan Treaty of Peace. In addition, on 25 May 2000, Israel withdrew unilaterally from southern Lebanon, which it had occupied since 1982. In keeping with the framework established at the Madrid Conference in October 1991, bilateral negotiations were conducted between Israel and Palestinian representatives and Syria to achieve a permanent settlement. In April 2003, US President Bush, working in conjunction with the EU, UN, and Russia - the "Quartet" - took the lead in laying out a roadmap to a final settlement of the conflict by 2005, based on reciprocal steps by the two parties leading to two states, Israel and a democratic Palestine. However, progress toward a permanent status agreement was undermined by Palestinian-Israeli violence between September 2000 and February 2005. An agreement reached at Sharm al-Sheikh in February 2005 significantly reduced the violence. In the summer of 2005, Israel unilaterally disengaged from the Gaza Strip, evacuating settlers and its military while retaining control over most points of entry into the Gaza Strip. The election of HAMAS in January 2006 to head the Palestinian Legislative Council froze relations between Israel and the Palestinian Authority (PA). Ehud OLMERT became prime minister in March 2006; he shelved plans to unilaterally evacuate from most of the West Bank following an Israeli military operation in Gaza in June-July 2006 and a 34-day conflict with Hizballah in Lebanon in June-August 2006. OLMERT in June 2007 resumed talks with the PA after HAMAS seized control of the Gaza Strip and PA President Mahmoud ABBAS formed a new government without HAMAS. OLMERT in September 2008 resigned in the wake of several corruption allegations, but remained prime minister until the new coalition government under former Prime Minister Binyamin NETANYAHU was completed in late March 2009, following the February general election. Population (2009 est. ): 7.23 million. Annual population growth rate (2009 est. ): 1.7%. Ethnic groups: Jews 76.2%; Arabs 19.5%; other 4.3%. Health: Infant mortality rate (2009 est.) --4.22/1,000 births. Life expectancy at birth--80.73 years; female 82.95 years, male 78.62 years. Political parties: Labor, Likud, Kadima, and various other secular and religious parties, including some wholly or predominantly supported by Israel's Arab citizens. A total of 12 parties are represented in the 18th Knesset, elected February 2009. GDP (2008 est. ): $203.4 billion. Annual growth rate (2008): 4.2%. Per capita GDP (2008): $28,600. Currency: Shekel (3.82shekels = 1 U.S. dollar; 2009 est.). Trade: Exports (2008 est.) --$57.16 billion. Exports include polished diamonds, electronic communication, medical and scientific equipment, chemicals and chemical products, electronic components and computers, machinery and equipment, transport equipment, rubber, plastics, and textiles. Imports (excluding defense imports, 2008 est.) --$64.4 billion: raw materials, diamonds, energy ships and airplanes, machinery, equipment, land transportation equipment for investment, and consumer goods. Major partners--U.S., U.K., Germany; exports--U.S., Belgium, Hong Kong; imports--U.S., Belgium, Germany, Switzerland, U.K.
Of the approximately 7.23 million Israelis in 2009, about 76% were counted as Jewish, though some of those are not considered Jewish under Orthodox Jewish law. Since 1989, nearly a million immigrants from the former Soviet Union have arrived in Israel, making this the largest wave of immigration since independence. In addition, an estimated 105,000 members of the Ethiopian Jewish community have immigrated to Israel, 14,000 of them during the dramatic May 1991 Operation Solomon airlift. 32.9% of Israelis were born outside of Israel. The creation of the State of Israel in 1948 was preceded by more than 50 years of efforts to establish a sovereign state as a homeland for Jews. These efforts were initiated by Theodore Herzl, founder of the Zionist movement, and were given added impetus by the Balfour Declaration of 1917, which asserted the British Government's support for the creation of a Jewish homeland in Palestine. The run-up to disengagement saw a flurry of diplomatic activity, including the February 2005 announcement of Lieutenant General William Ward and subsequently Lieutenant General Keith Dayton as U.S. Security Coordinator; the March 2005 Sharon-Abbas summit in Sharm el-Sheikh; the return of Egyptian and Jordanian ambassadors to Israel; and the May 2005 appointment of former World Bank president James D. Wolfensohn as Special Envoy for Gaza Disengagement to work for a revitalization of the Palestinian economy after disengagement. On August 15, 2005, Israel began implementing its disengagement from the Gaza Strip, and the Israeli Defense Forces completed their withdrawal, including the dismantling of 17 settlements, on September 12. After broad recognition for Prime Minister Sharon's accomplishment at that fall's UN General Assembly, international attention quickly turned to efforts to strengthen Palestinian governance and the economy in Gaza. The United States brokered a landmark Agreement on Movement and Access between the parties in November 2005 to facilitate further progress on Palestinian economic issues. However, the terrorist organization Hamas--building on popular support for its "resistance" to Israeli occupation and a commitment to clean up the notorious corruption of the Palestinian Authority (PA)--took a majority in the January 2006 Palestinian Legislative Council (PLC) elections, with Hamas leader Ismail Haniya as Prime Minister. The Israeli leadership pledged not to work with a Palestinian government in which Hamas had a role. Shortly following Hamas' PLC victory, the Quartet--comprised of the United States, European Union, United Nations. and Russia--outlined three basic principles the Hamas-led PA must meet in order for the U.S. and the international community to reengage with the PA: renounce violence and terror, recognize Israel, and respect previous agreements, including the roadmap. The Hamas-led PA government rejected these principles, resulting in a Quartet statement of "grave concern" on March 30, 2006 and the suspension of U.S. assistance to the PA, complete prohibition on U.S. Government contacts with the PA, and prohibition of unlicensed transactions with the PA government. The Palestine Liberation Organization (PLO) under the leadership of PLO Chairman and PA President Mahmud Abbas (Abu Mazen), by contrast, remained consistently committed to the Quartet principles. Despite several negotiated cease-fires between Hamas and Fatah, violent clashes in the Gaza Strip--and to a lesser extent in the West Bank--were commonplace between December 2006 and February 2007 and resulted in dozens of deaths and injuries. In an attempt to end the intra-Palestinian violence, the King of Saudi Arabia invited Palestinian rivals to Mecca, and on February 9, 2007, Abbas and Hamas leader Haniya agreed to the formation of a Palestinian national unity government and a cessation of violence. Hamas' rejectionist policies and violent behavior continued despite the formation of the national unity government. In June 2007, Hamas effectively orchestrated a violent coup in Gaza. Hamas also launched scores of Qassam rockets into southern Israel in an attempt to involve Israel in the Hamas-Fatah conflict. On June 14, Palestinian Authority President Mahmoud Abbas exercised his lawful authority by declaring a state of emergency, dissolving the national unity government, and replacing it with a new government with Salam Fayyad as Prime Minister. The Palestinian Authority (PA) government under President Abbas and Prime Minister Fayyad has no elements controlled by Hamas. The government is dedicated to pursuing a negotiated solution to the Arab-Israeli conflict, and the Quartet principles. As a result, the PA has been supported politically and financially by the international community, and engaged by Israel. The U.S. reinstated its assistance to the PA in 2007 and provides budget and development assistance as well as support for the PA’s efforts to reform and improve security and rule of law in the West Bank. In November 2007, Israeli and Palestinian leaders participated in an international conference in Annapolis, at which they committed to launch bilateral negotiations towards the establishment of a Palestinian state in the West Bank and Gaza, and the realization of Israeli-Palestinian peace. During the year that followed, Israeli Prime Minister Olmert and Palestinian Authority President Abbas and other members of their governments engaged in regular bilateral negotiations on final status issues. Although the two sides reportedly narrowed their differences on some issues, the negotiations were suspended in December 2008 when conflict broke out between Israel and Hamas in Gaza. On December 27, 2008, in response to a sharp increase in the number and frequency of rocket attacks into Israel shortly prior to and following the formal expiration of a six-month "calm" between Israel and Hamas, the Israel Defense Forces launched Operation Cast Lead, targeting Hamas security installations, personnel, and other facilities in the Gaza Strip. The Israeli military operation continued until January 18, 2009, when Israel and Hamas each declared a unilateral cease-fire. On January 22, 2009, President Obama named Senator Mitchell his and Secretary Clinton’s special envoy for Middle East peace. Special Envoy Mitchell immediately travelled to the region and has subsequently returned on a nearly monthly basis in an effort to help create the conditions that would support a two-state solution as part and to re-launch credible and productive negotiations. The President has visited Turkey, Egypt, and Saudi Arabia and hosted Prime Minister Netanyahu and numerous Arab heads of state in Washington. On September 22, he hosted a trilateral meeting with Prime Minister Netanyahu and President Abbas, and he has written to over a dozen Arab heads of state asking for their assistance in ending the Arab-Israeli conflict. The Secretary has met many leaders from the region and has traveled to the Middle East multiple times since her appointment to promote a Middle East peace settlement. In those elections--the first direct election of a Prime Minister in Israeli history--Likud leader Binyamin Netanyahu won by a narrow margin, having sharply criticized the government's peace policies for failing to protect Israeli security. Netanyahu subsequently formed a right-wing coalition government publicly committed to pursuing the peace process, but with an emphasis on security and reciprocity. In 1999, with a shrunken coalition and facing increasing difficulty passing legislation and defeating no-confidence motions, Netanyahu dissolved parliament and called for new elections. This time, the Labor candidate--Ehud Barak--was victorious. Barak formed a mixed coalition government of secular and religious parties, with Likud in the opposition. In May 2000, Barak fulfilled one of his major campaign promises by withdrawing Israeli forces from Southern Lebanon. However, by mid-autumn, with the breakdown of the Camp David talks and the worsening security situation caused by the new intifada, Barak's coalition was in jeopardy. In December, he resigned as Prime Minister, precipitating a new prime ministerial election. The summer of 2004 saw renewed instability in the government, as disagreement over the Gaza disengagement plan resulted in Sharon's firing two ministers of the National Union Party and accepting the resignation of a third from the National Religious Party in order to secure cabinet approval of the plan (it was endorsed on June 6, 2004). Continuing divisions within the Likud on next steps then prompted Ariel Sharon to leave the party in November 2005 to form the Kadima ("Forward") party and call new elections for March 2006. However, Sharon was unexpectedly incapacitated in January 2006 due to a severe stroke and leadership of Kadima shifted to Acting Prime Minister Ehud Olmert. Olmert led the Kadima party to its first electoral victory on March 28, and was able to form a coalition with Labor and several smaller parties. The new government was sworn in on May 4, 2006. Following the attorney general opening a series of corruption investigations, Olmert resigned in September 2008. In October, President Peres asked deputy Prime Minister and Foreign Minister Tzippi Livni to form a new government. When Livni was unable to secure a governing majority, President Peres called for new elections to occur in February 2009. Even though Kadima, led by Tzippi Livni won more seats than any other single party, right-of-center parties, both religious and secular, had the largest overall gains in the new Knesset. Subsequently, President Peres asked Likud-leader Netanyahu to form a government. 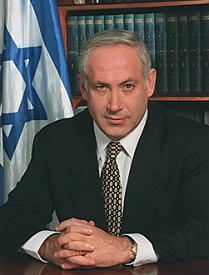 Netanyahu was sworn in as Prime Minister for the second time on March 31, 2009. Today, Israel has diplomatic relations with 163 states. Following the signing of the Israel-PLO Declaration of Principles on September 13, 1993, Israel established or renewed diplomatic relations with 36 countries. Israel has full diplomatic relations with Egypt and Jordan. In addition, on October 1, 1994, the Gulf States publicly announced their support for a review of the Arab boycott, in effect abolishing the secondary and tertiary boycotts against Israel. Israel's ground, air, and naval forces, known as the Israel Defense Force (IDF), fall under the command of a single general staff. Conscription is universal for Jewish men and women over the age of 18, although exemptions may be made on religious grounds. Druze, members of a small Islamic offshoot living in Israel's mountains, also serve in the IDF. Israeli Arabs, with the exception of some Bedouins, do not serve. During 1950-66, Israel spent an average of 9% of GDP on defense. Real defense expenditures increased dramatically after both the 1967 and 1973 wars. The defense budget in 2009 totals USD 12 billion, representing 6.2% of GDP, and accounting for 16.3% of government expenditures. US military aid to Israel in 2009 totals USD 2.55 billion. This will increase to USD 3 billion in 2012, and will total USD 3.15 billion a year from 2013 to 2018. Commitment to Israel's security and well being has been a cornerstone of U.S. policy in the Middle East since Israel's founding in 1948, in which the United States played a key supporting role. Israel and the United States are bound closely by historic and cultural ties as well as by mutual interests. Continuing U.S. economic and security assistance to Israel acknowledges these ties and signals U.S. commitment. The broad issues of Arab-Israeli peace have been a major focus in the U.S.-Israeli relationship. U.S. efforts to reach a Middle East peace settlement are based on UN Security Council Resolutions 242 and 338 and have been based on the premise that as Israel takes calculated risks for peace the United States will help minimize those risks. On a bilateral level, relations between the United States and Israel are continually strengthening in every field. In addition to the Joint Political-Military Group described above, there are: bilateral science and technology efforts (including the Binational Science Foundation and the Binational Agricultural Research and Development Foundation); the U.S.-Israeli Education Foundation, which sponsors educational and cultural programs; the Joint Economic Development Group, which maintains a high-level dialogue on economic issues; the Joint Counterterrorism Group, designed to enhance cooperation in fighting terrorism; and a high-level Strategic Dialogue.